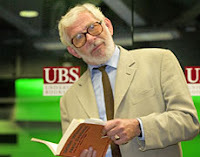 Further tributes to Professor Terry Sturm who died Monday. NZ Herald photo by Richard Robinson. Read my earlier report here. I worked with Terry on the Literature advisory komiti, and afterwards when the QE2 Literary panel was formed.He was a warm & friendly person who never displayed in any aggressive fashion his phenomenal knowledge of literature & academia. and am truly sorry to learn he is dead. What I enjoyed about working with Terry (and you, Keri) on that Literary Fund Committee was the friendly, collegial spirit which Terry's chairmanship encouraged. In our often excitable debates, he took victory or defeat with equal grace and good humour. Terry will be greatly missed by so many.